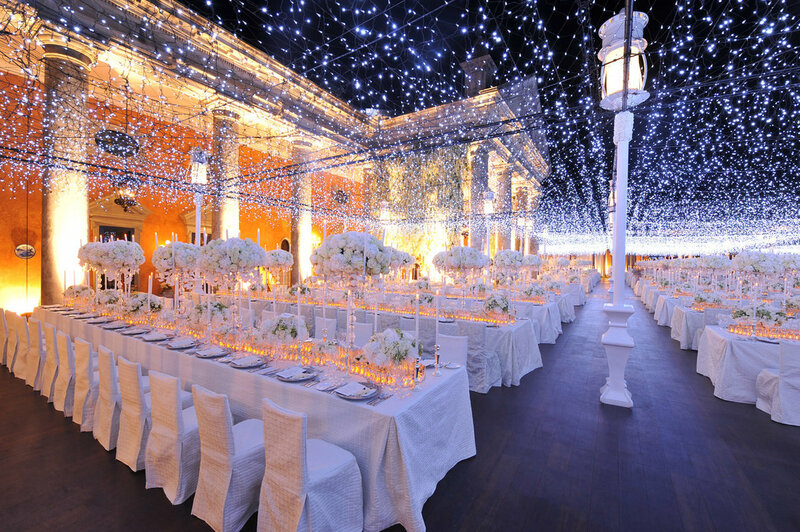 Create a "ceiling" of twinkling lights to reflect the night sky during an outdoor wedding. Transform a barn into a glamorous ballroom with light strands and chandeliers. The dramatic centerpieces combined with the purple uplighting transform this reception space into a winter wonderland. Blend a few different colors for this watercolor-inspired effect. Cool uplighting, candles, and chandeliers warm up an industrial loft wedding reception. Give your reception a frosty feel with icy blue lights. Don't be afraid to go bold with your uplighting! Wow your guests with a cool lighting installation. Creating a stunning photo backdrop is as simple as hanging a few strands of twinkling lights. Put the focus on your head table with strands of café lights. Your guests will feel like they've been transported to an enchanted garden with this romantic idea. Floating paper lanterns are a fun and colorful way to punch up your reception space. Jewel-toned lanterns, combined with cool uplighting, provide a soft glow. Lanterns provide a warm glow over your nighttime reception. Choose paper lanterns that contrast your uplighting. Bring the indoors out with chandeliers over your dance floor. An illuminated aisle is an ultra-romantic idea for a nighttime ceremony. Add the appearance of texture on your walls with creative lighting. Create a beautiful backdrop for a winter wedding ceremony with images of trees. Give your wedding a one-of-a-kind feel with a pattern projected across the ceiling. Highlight your monogram with a wavy image projection. A light-up dance floor will be a fun surprise for your guests. Pin lights give this dance floor a magical feel. Dance under the moon and stars in your own fairy tale wedding.